The national safety day in India is 4th of March as marked by National Council of Safety, India. Celebrating safety day has lead to reduction in number of accidents in Industries and has created overall awareness. The primary objective is Safety, health and awareness. India has more than 500 million workers in organized and unorganized sector. With a reported incident rate of approximately 1 percent. Considering the large number of population involved in labor both organized and unorganized, safety of workers is of paramount importance. We are trying to focus on the flange safety problem. Flanges are connecting rings and are used in a piping system as pipe joints. Flanges are integral part of piping system. Flanges are also subject to failures depending upon the end of life, gasket used and the maintenance efficiency. These piping system carry liquids at times at very high pressure and temperature. Many a times these gases and chemicals are very toxic and lethal on getting released in the environment and protection is must for humans working around them. Flange leaks could lead to catastrophic damage to machineries and man power. Most of the times there is a high pressure jet spray (owing to the pressure at which the liquid is flowing inside the pipe) spillage. In an industrial environment workers are working all the time near piping systems carrying gas, steam, fuel and chemicals. So to have a safe environment for your manpower and equipment Flange guards are used. 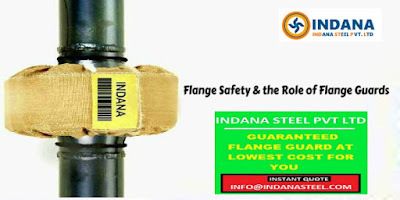 Flange guards cover your flanges and prevent any direct spillage and let a safe discharge of the fluid. Depending on your process and the fluid different guards are suggested to meet the requirements. Not every shield is the same and not every shield will work. Flange shield are priced according to your process requirement primarily pressure, Flange dimensions, temperature, fluid type and environment. Most commonly manufactured flange guards are in HDPE,SS316 and PTFE coated fiberglass fabric. When considering a guard the coverage of a shield is of paramount importance. We at INDANA STEEL PVT.LTD offer our customers a Guarantee of performance for 2 years for any shield manufactured by us. All our flange guards are hydro tested for performance. Our testing rig makes it possible. Beware of cheap shields which will not serve your purpose and in totality make you loose money without even providing protection that is required. Please get in touch with us info@indanasteel.com.We are happy to help.